if you just want to see the super easy update via CLI steps, jump below. Embedded Host Client, baked right into ESXi 6.0U2! 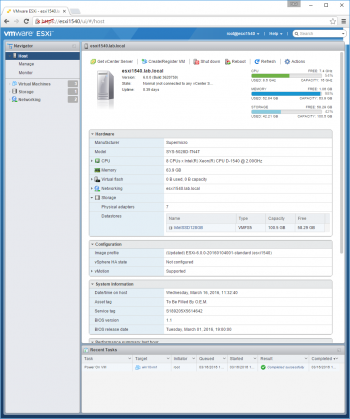 This is a big deal, the arrival of a HTML5 UI baked right into the ESXi Hypervisor. It's just a start, marking the start of an Adobe Flash-free future, and a way to slickly manage even the free Hypervisor found in many home labs. 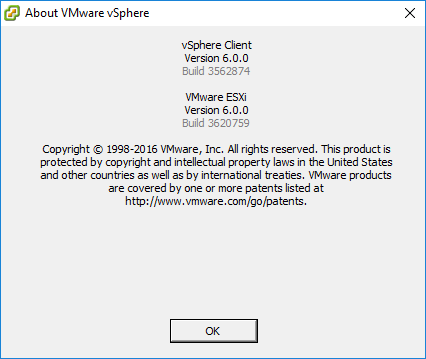 If you don't have a commercial VMware license, and instead are using a trial, free, or EVALExperience ESXi 6.0 or ESXi 6.0 Update 1/1a/1b, you won't be able to easily download the 6.0 Update 2 ISO directly. You're not entitled. Silly, I know. Worry not though, since this article has you covered. Takes about 10 minutes total. 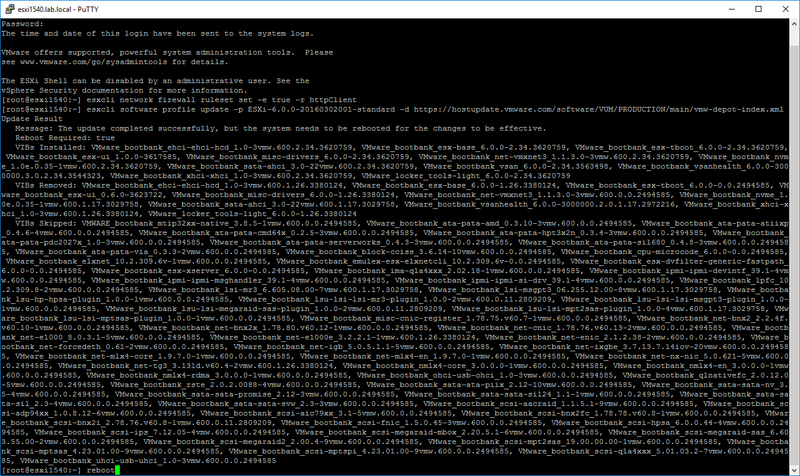 Basically you paste two commands, wait for the automated download and patch process, then finish up with a host reboot. The command syntax for updating ESXi 6.0 was easily figured out, thanks to prior work by Andreas Peetz and William Lam! Disclaimer: This method assumes you can install the default ESXi Image Profile with no additional drivers or packages, else you may have connectivity issue after the upgrade. If you still need to customize the ESXi Image Profile before installation, you will still need to use something like Image Builder and then upload that to your online depot. Important note: Before doing this please check whether you rely on one of the NIC drivers (e.g. Realtek) that were blacklisted in ESXi 6.0. You then need to carry out an additional step before doing the upgrade - see my earlier post (section 2) for details. For my SuperServer Workstation, I didn't have to worry about VIBs: the stock drivers built into 6.0 are all I need to succeed. Even if I do need AHCI or NVMe VIBs in the future, I can just re-add such VIBs after similar future upgrades, or even inject them into a custom ISO. If you turned on maintenance mode earlier, remember to turn it back off now. Type "reboot" and hit return (to restart your ESXi server). After the reboot is done, it would be a good idea to test login using both the vSphere Client and the vSphere Web Client, to be sure everthing seems to be working right. Special thanks to VMware ESXi Patch Tracker by Andreas Peetz at the VMware Front Experience Blog. 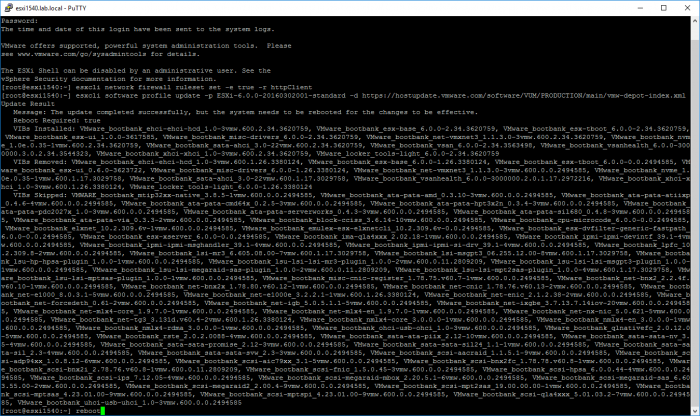 Here's how my upgrade from build 3380124 to 3620759 looked, right after the 3 minute download/patch. That's it! 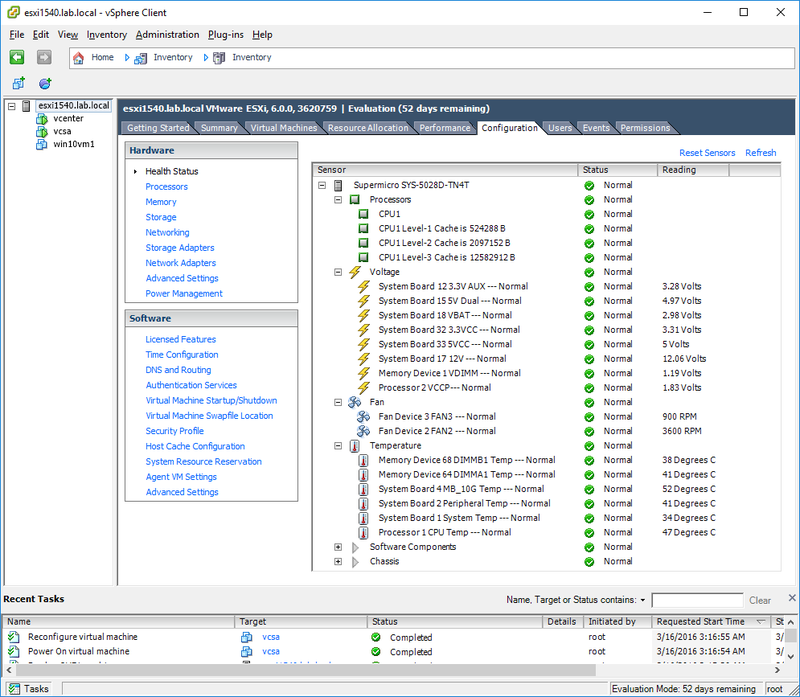 When the reboot is complete, you'll see for yourself that you now have the latest ESXi, Build 3620759, as pictured above. Now you have more spare time to read more TinkerTry articles! By the way, you could use VMware Update Manager on a Windows system or VM, but for one-off upgrades typical in a small home lab, pasting these 2 lines of code is pretty easy. My home lab's Supermicro SuperServer is working quite nicely with 6.0U2, as one would expect from a system on the VMware HCL. 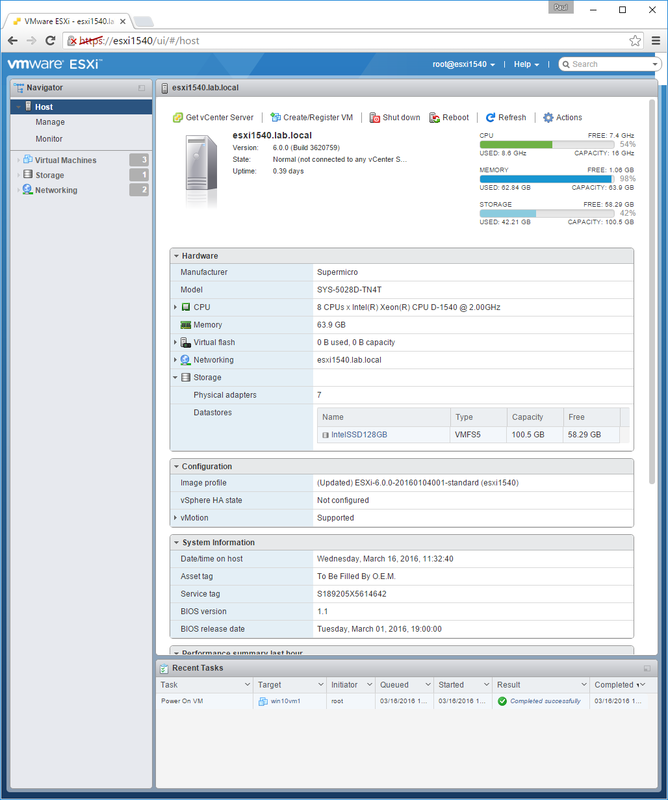 If it turns out to work fine, I should also create another separate article just about this ESXi 6.0U3 easy update.